The Retail Services Price Index (RSPI) rose 1.2% in the third quarter, mainly as a result of higher margins at building material and garden equipment and supplies dealers. Margins were up in 8 of the 10 major retail subsectors, representing 82% of the retail sector surveyed. Building material and garden equipment and supplies dealers posted a margin increase of 3.5%. The growth was concentrated in the home centres industry (+4.9%), where retailers reported higher selling prices. Sustained demand for building materials partly contributed to higher selling prices. Margins at electronics and appliance stores were up 7.7%, attributable to higher selling prices. Retailers at furniture and home furnishings stores recorded a margin increase of 5.4%, as all industries in this subsector posted margin gains. Selling prices increased faster than vendor prices, resulting in higher margins. Moderating the growth of the RSPI were lower margins at general merchandise stores (-3.3%) and miscellaneous store retailers (-1.6%). The RSPI increased 1.4% in the third quarter compared with the same quarter in 2017. Of the 10 major retail subsectors surveyed, 4 were up, 5 were down and 1 was unchanged. Electronics and appliance stores (+10.7%) posted the largest margin increase in the RSPI, mainly as a result of strong margin growth in the third quarter. Margins at building material and garden equipment and supplies dealers rose 10.3%, marking 17 consecutive year-over-year increases. Retailers at furniture and home furnishing stores (+7.2%) also registered year-over-year margin gains. The year-over-year increase in the RSPI was mainly moderated by lower margins at general merchandise stores (-3.5%). The Retail Services Price Index (RSPI) represents the change in the price of the retail service. The price of the retail service is defined as the margin price, which is the difference between the average purchase price and the average selling price of the retail product being priced. The RSPI is not a retail selling price index. Statistics Canada has undertaken an important initiative for the RSPI. With the data release of the fourth quarter of 2017, data-quality indicators have been added for indexes where quality is reduced. Many indexes that were previously suppressed are now available, beginning with the release of data for the third quarter of 2017. Data-quality indicators are based on measures of survey precision (standard errors), estimates of market coverage (based on the RSPI sample), and the number of reported price quotes. Index series without data-quality indicators are considered to be statistically reliable. Users are encouraged to take into account quality indicators when using RSPI data. The infographic, "Retail Services Price Index (RSPI) 2008 to 2017," which is part of Statistics Canada — Infographics (Catalogue number11-627-M), is now available. 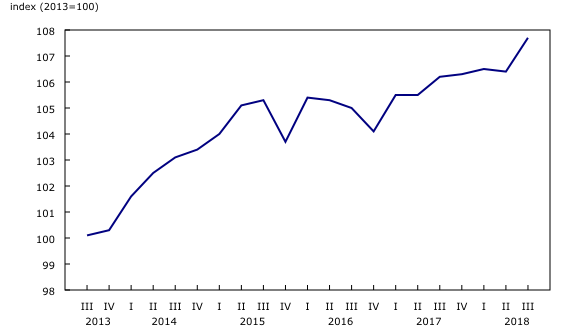 It demonstrates how margins in the Canadian retail trade sector have evolved from the first quarter of 2008 to the fourth quarter of 2017.